After living in Germany, I will always associate holiday time with speculoos cookies. At every Christmas market throughout Europe, you will find beautiful and perfectly spiced cookies. Some are adorned with glaze, some with almonds, and some even handpainted. 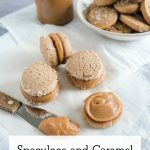 My spin is a simple speculoos cookie sandwiched with a thick and gooey caramel filling. 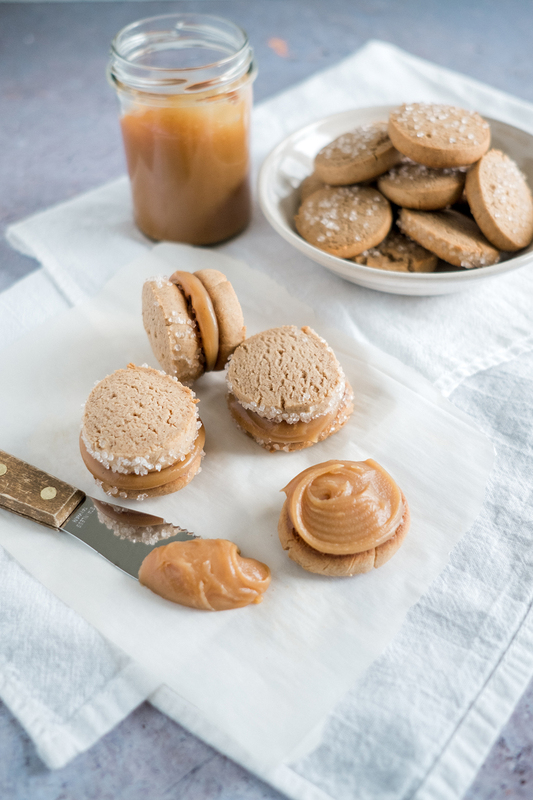 Speculoos cookies are meant to be eaten with a hot drink – whether it be coffee, tea, or gluhwein (hot mulled wine that is popular in Germany). 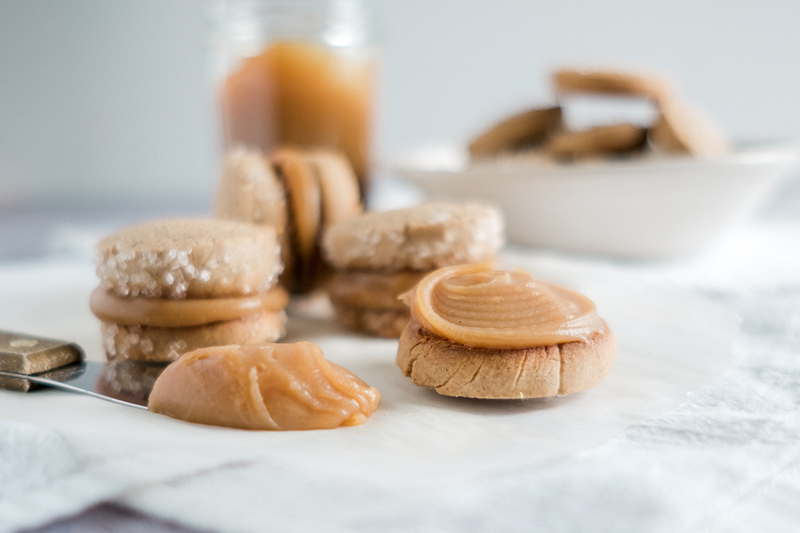 Any leftover caramel can be kept in an airtight container in the fridge for up to two weeks. It also makes a delicious food gift. It can be warmed and poured over ice cream, served with pie, or stirred into a steamy hot cup of coffee. Cream butter and both sugars in the bowl of an electric mixer. Beat until light and fluffy, about 5 minutes. Add honey, egg, and vanilla and mix for another two minutes. Whisk together flour, cinnamon, ginger, nutmeg, cloves, and salt. 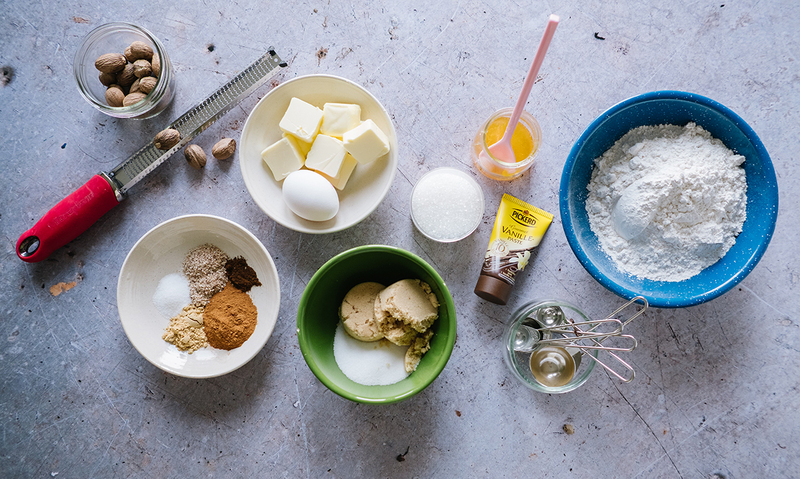 Add to the mixer and mix until flour is just combined. Turn the dough out onto a work surface. 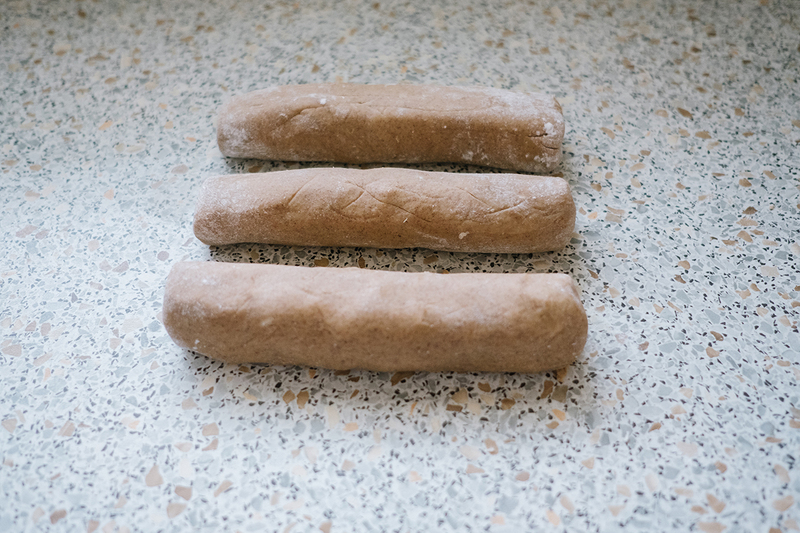 Divide dough into three, and roll into 8-inch long logs. Wrap in plastic and chill for three hours, preferably overnight. Preheat oven to 375°. Line baking sheet with parchment paper. 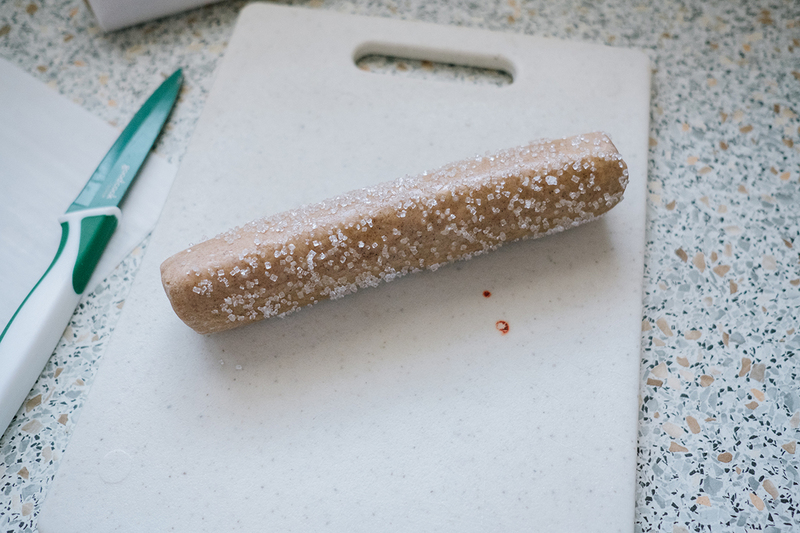 Brush the log with water and roll edges in sanding sugar. Or slice and sprinkle tops with sanding sugar. 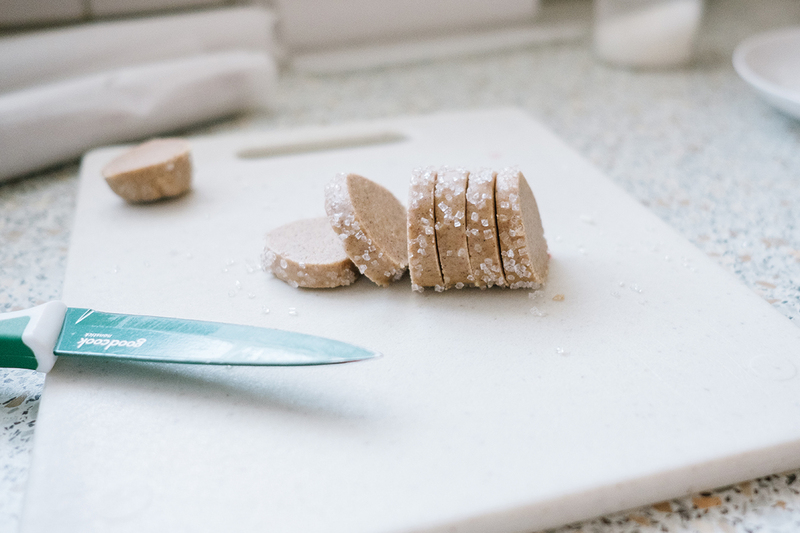 Slice into ¼ inch rounds and place on baking sheet. Bake for 11 to 13 minutes, or until golden brown. Let cool on wire rack. To make the caramel, add butter to a large bowl. Sprinkle flaked sea salt over butter along with vanilla bean paste. Put a sieve over the butter. Set aside. Heat the cream in the microwave for a minute and a half. Set aside. Add sugar and water to a heavy-bottomed saucepan. Bring the sugar and water to a boil over medium-high heat. Do not stir. The sugar will cook to an amber, golden brown color, about minutes. When the sugar reaches the desired color, slowly whisk in the HOT cream. Turn off the heat and whisk until combined. Pour the hot caramel through the sieve over the butter. The butter will cool down the sugar and melt. 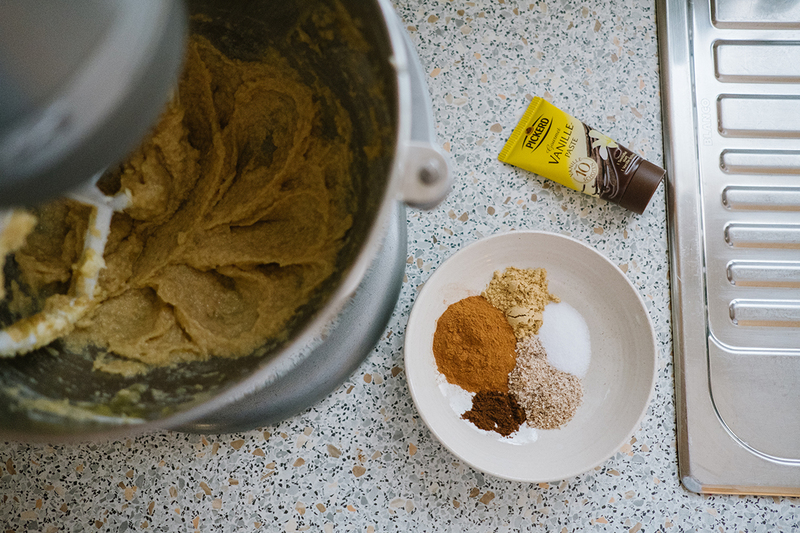 Let it stand for a few minutes, then whisk until it all comes together. Whisk until smooth and combined. Let cool completely, as the caramel will thicken to a spreading consistency as it cools. 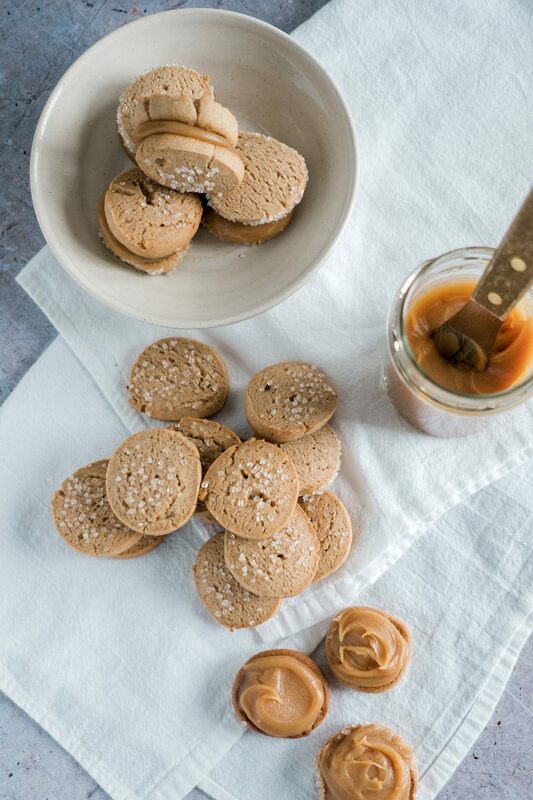 Make the cookies into sandwiches, and enjoy! 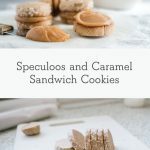 Speculoos Cookies are one of the 25 holiday cookies in the 2018 Holiday Cookie Bake Off, where you can bake-to-win over $1,000 in prizes. Find out more here! Bree is the founder and writer of BakedBree.com, a recipe site that shares her love of cooking, baking, and entertaining with others. BakedBree.com launched in February of 2010 as a way to merge Bree’s love of photography with her love of food, and share both with friends and family. Currently, Bree lives in Stuttgart, Germany with her husband and 3 children. You can follow her family’s travel on Instagram. Previous Previous post: New Features on Pinhole Press!